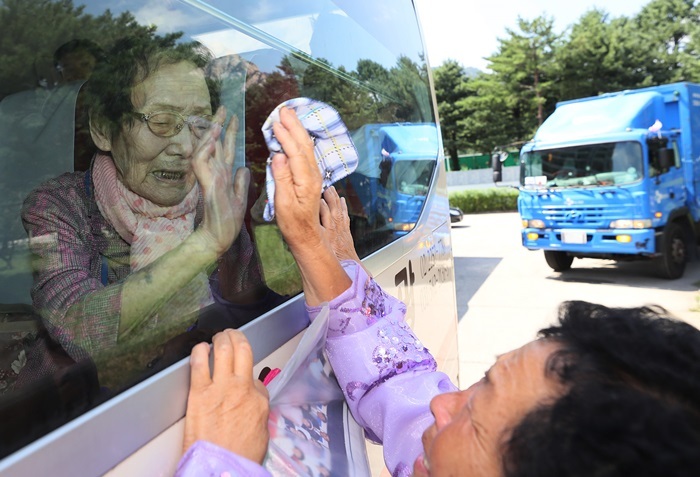 On Aug. 22, the last day of the 21st inter-Korean family reunions, Han Shin-ja from South Korea touches the bus window in her attempt to feel her North Korean daughter’s hand as she bids farewell on the bus. South Korea's 91-year-old Lee Gi-sun, who wanted to ask his son whether he likes to drink, too, took a bottle of soju with him when he entered the reunion hall. It was the first shot of liquor he ever drank with his long-lost son, Lee Gang-seon, from North Korea. Eyes red with tears, Lee couldn’t bear to finish the sentence, “We parted when you were 2... just 2-years-old..." as he stared at his son who just turned 75. A total of 89 war-separated South Koreans participated in the 21st round of inter-Korean family reunions. They held their final meetings on Aug. 22 starting at 10 a.m. at the Mount Kumkang resort for three hours. The war-separated families couldn’t hold back their tears at the thought of parting as soon as they met. The hearts of elderly members ached in particular, thinking this would be the last. 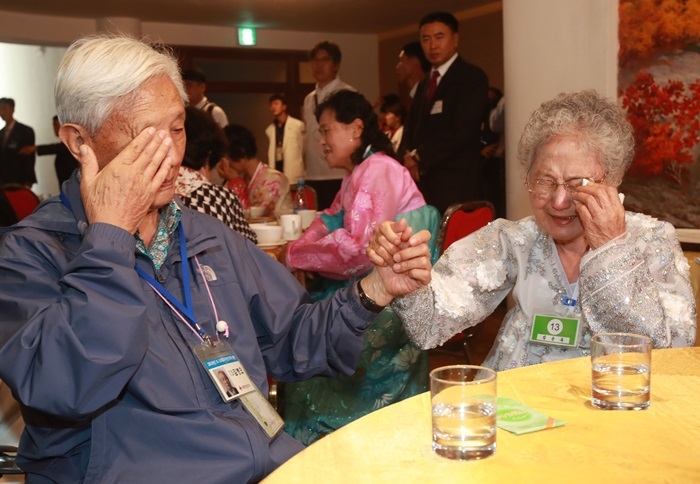 South Korea's 88-year-old Kim Byung-oh sheds tears at the thought of parting with his North Korean sister Kim Sun-ok during the last farewell meeting of the 21st inter-Korean family reunions held at Mount Kumkang resort. South Korea's 88-year-old Kim Byung-oh, who met his North Korean sister and grandson, put on a grim expression and didn’t say a word during the farewell meeting. His son, Kim Jong-seok, spoke for his father, saying, “He seems troubled, thinking this could be it during his lifetime.” His North Korean sister, who tried to remain composed, couldn’t keep her lips from trembling. Tears rolled down the siblings’ cheeks as they looked at each other. South Korea's 93-year-old Ham Sung-chan poured his North Korean brother a glass full of beer and made a toast. The two posed for pictures amid a hearty atmosphere as Ham’s daughter took their photos. A lot of families could be seen taking photos to remember that moment in the reunion hall. South Korea's 92-year-old Kim Dal-in took some family photos with his North Korean sister. The siblings, who were meeting after 68 years, looked at the camera holding hands wrinkled with age. South Korea's 75-year-old Kim Hye-ja affectionately kissed a Polaroid of her North Korean brother and handed him a note with her address and phone number. A total 12 hours, on six occasions, were given to these war-separated families, starting with the first family reunions on Aug. 20 at 3 p.m., until the final farewell meeting and a group lunch on Aug. 22. The bittersweet three days ended with the South Korean delegation heading back southward. Unlike prior reunions, the 21st round of inter-Korean family reunions allowed participants to eat lunch together on the second day. The last farewell meeting, which was intended to last only two hours, was also extended to three hours, as North Korea accepted South Korea’s suggestion. The second round of the reunions, which will reunite 83 North Koreans with their South Korean relatives, will be held from Aug. 24 to 26.